Living a life on wheels isn’t everyone’s dream. But it’s mine! Right now, thinking about how life on wheels could (or couldn’t) work frazzles my mind, but it’s there as a “one day” dream… It’s my fall back dream. And actually, it is a dream Andre & I have already had the great fortune to live, for a few blissful (ignoring the fairly regular tantrum days!) months. That was pre-kids, pre-home ownership, pre-proper career, pre-overinflated sense of responsibility. Now, that over-inflated sense of responsibility gets in the way of such dreams, but I still have hope to quash that and just do it anyway. Part of my plan is to devour every post and picture that encourages that dream! This darling home on wheels by Tiny Heirloom, via my scandinavian home, has added a lot of determination. How could it not?! Creature comforts, and a sense of style are not forgotten! This entry was posted in Interiors, Small Spaces, Style and tagged dreams, home on wheels, interior, small house, small spaces, style, tiny house on May 13, 2015 by Jolene. And despite my ignorance as to what this one is all about – it links to here, but I can’t spot it – it has me intrigued with it’s well executed combo of traditional style and contemporary fitout. It would make a perfect mini flat out the back of someone’s big ol’ house, or a cosy holiday house in the woods. Amp up the contemporary style and it would look equally as at home near the beach. 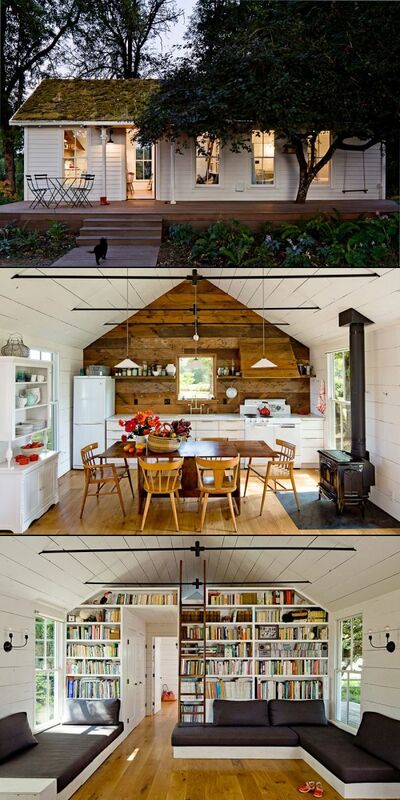 I love the porch-tree-swing, the farmhouse table right alongside the kitchen, and the built in seating that tucks right up to the shelving and the windows. Gorgeous! This entry was posted in Design, Small Spaces and tagged apartment, contemporary, farmhouse, holiday house, interior style, pinterest, small spaces, traditional on January 22, 2015 by Jolene. If ever you have a difficult building site, or just an extra special landscape you don’t want to mar… the bridge house could be your thing. Besides “touching the earth lightly” this one by Max Pritchard Architects is packed with eco features such as a black concrete floor for thermal mass, huge north facing and double-glazed windows, steel louvres for summer shade and solar water heating. PS. Anyone know that ol’ railway bridge on the left just at the southern edge of Ohakune village? The property it is on was for sale a while back and I reeeeeeeally wanted to buy it and create a house on the bridge. Big old arches and all. How fun would that have been? And it looked straight up to Mt Ruapehu. Amazing… but not to be. This entry was posted in Small Spaces and tagged architecture, australia, bridge house, small house, small spaces on September 3, 2014 by Jolene. That brick?! Inside AND out. Love that. 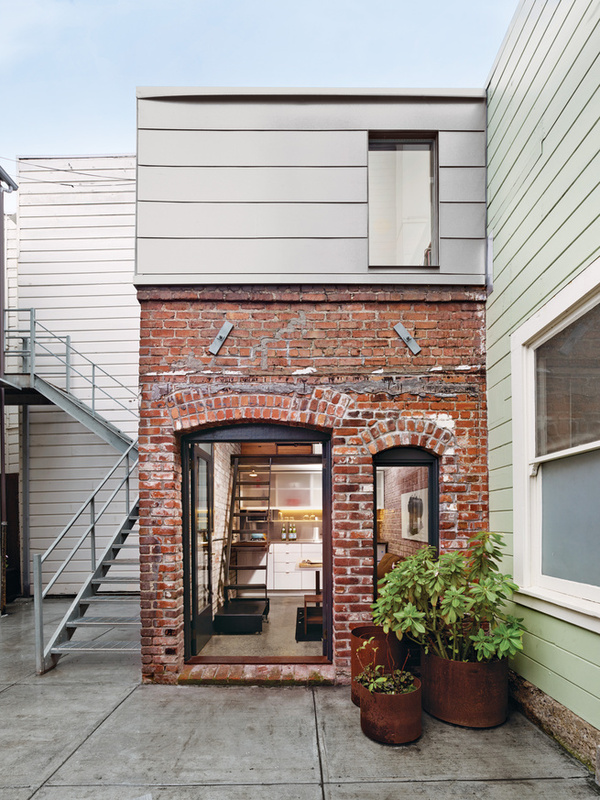 This one is a small one bedroom loft guesthouse, in San Fran. 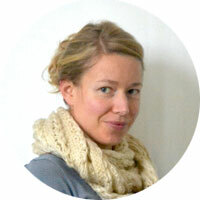 The architect made use of a small footprint by going up, up, up! On the lower level is the kitchen and living area, and the mezzanine bathroom is accessed by the ships ladder. Up top, across a glass walkway is the sleeping loft. Apparently it’s been described as a treehouse. Pretty amazing treehouse! I love the texture palette, and the natural colours mixed with bright white. Gorg! 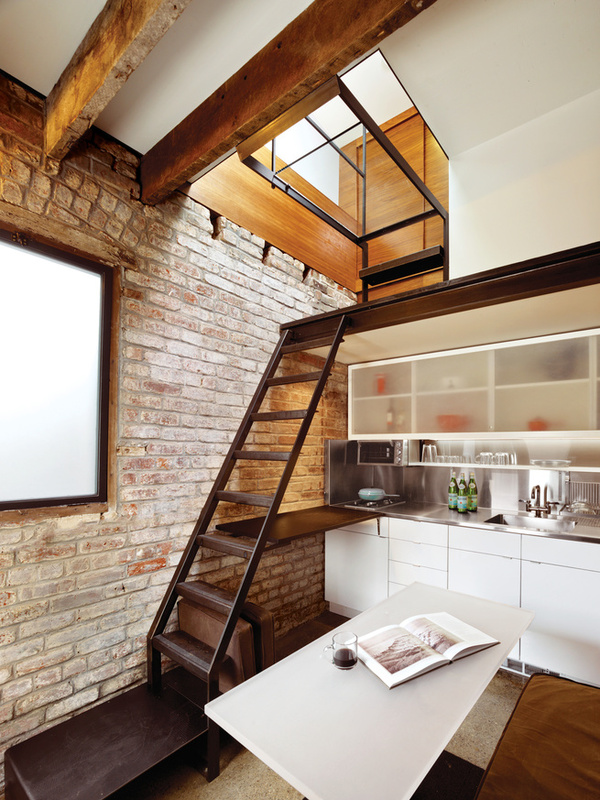 This entry was posted in Design, Interiors, Small Spaces and tagged brick wall, design, guest house, interior, loft, small spaces on August 27, 2014 by Jolene. I had something else in mind for today, but on further investigation… it’s not as small as it first appears, and I couldn’t think of a good enough reason to include it in this weeks Small Spaces. But have a little look, as there are a few ideas to steal for a much smaller space – like the sunken bath, and some built in furniture. So I’m just looking at small spaces instead, and I love this combined sleeping area, for how well it could work for a small family (of good sleepers!). You could use the lower bed as lounge seating during the day, simply by shifting the cushions up against the sill/shelf along the wall and making it a comfy day bed! For a family with a couple of littlies, I’d have to make some modifications for safety, add a curtain to pull across at sleep time and ensure the sleeping nook up top would happily take two mattresses as I’m not sure how much sleep they’d get all in together! Another option would be to create bunks, but sacrifice some storage. Although the storage is one thing I love about this layout! I also love the white on white with the addition of natural colours and textures. It’s a somewhat surprising (to me) direction we seem to be heading in our bedroom…! And to be honest I’m enjoying the extra space we have in our l’il house with a third bedroom back in action. It’s ok to like small spaces at the same time as liking a few more useable square metres in our fulltime house isn’t it?! 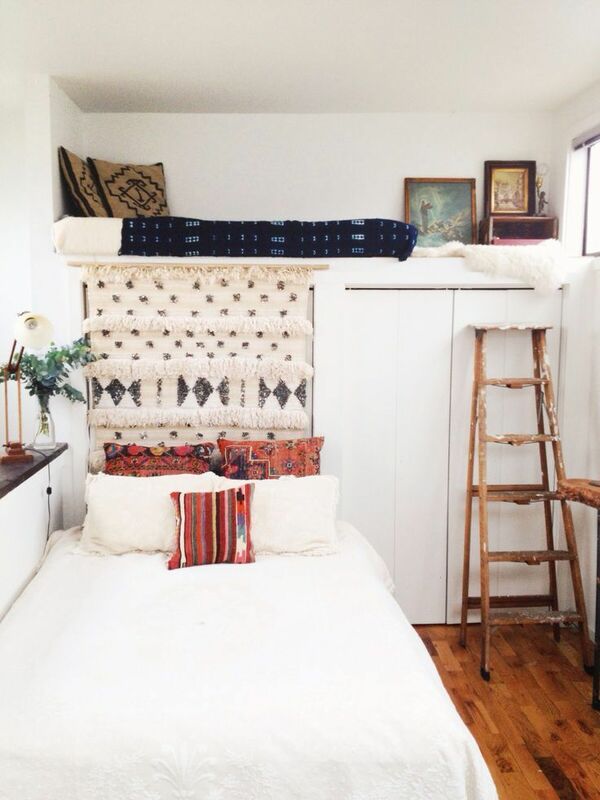 This entry was posted in Interiors, Small Spaces and tagged bach style, beach house, bunks, family sleeping, holiday house, sleeping loft, small spaces on August 20, 2014 by Jolene. This image had me doing a double-take when I spotted it on Pinterest this week, because at first glance it resembles the little flat we lived in in London! Not that ours was nearly as modern and tidy, but the layout and the white and neutral tones are a very close match. One difference is that we had a dividing wall between the kitchen and the dining/living area that made it more poky and a lot less amazing than this apartment in Antwerp. Nevertheless, it makes me long for the simple life of living small in a big city! I remember the only baking I ever did was a packet mix brownie that came with it’s own foiled cardboard baking tin! And it actually tasted pretty good! While I couldn’t resist adding some personal touches if I lived here, I do like the pared back colour palette, and the textures in the brick wall and the plywood cabinetry. And the sofa. This entry was posted in Interiors, Small Spaces and tagged antwerp, apartment, brick wall, city, living small, london, minimal, neutral, plywood, small spaces, texture, white on June 11, 2014 by Jolene. The sole reason I would like to one day have a two storey home, is so that I can have a spiral staircase! I fell in love with them on a lazy afternoon spent at Copenhagen Botanical Gardens where I wandered dreamily up and down this beautiful iron masterpiece. Since then I’ve sketched all manner of houses with spiral staircases as the centrepiece! They are perfect for small (albeit two storey, or at least a mezzanine/loft) spaces because they have a small footprint, and visually they can be very open and easy to work around. If you want some more inspiration I’ve just been on a little pinning spree and there are plenty to take your fancy, whether you’re into modern or vintage, minimal or fussy. 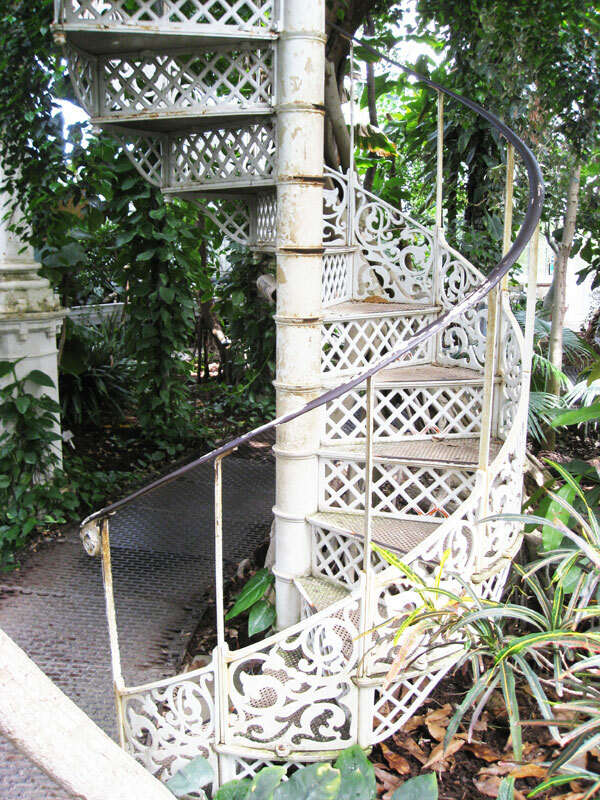 This entry was posted in Design, Small Spaces, Travel and tagged botanical gardens, copenhagen, inspiration, small spaces, spiral staircase on June 4, 2014 by Jolene.